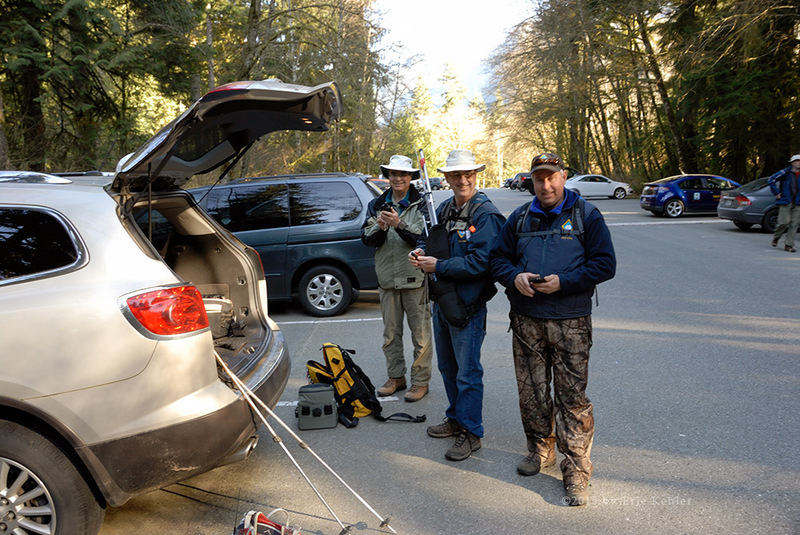 As a member of the local amateur radio club, I am always looking for ways to get the guys involved in some joint activity.The Summits on the Air program has caught the attention of several members and so I am regularly looking for ways to combine the club activity with my own desire to enjoy the outdoors. This winter we had almost no snow locally and so we are able to hike the lower peaks without concern for snow. It was for these reasons that we chose to hike the start of the Diez Vistas Trail to the summit of Farrer Peak. 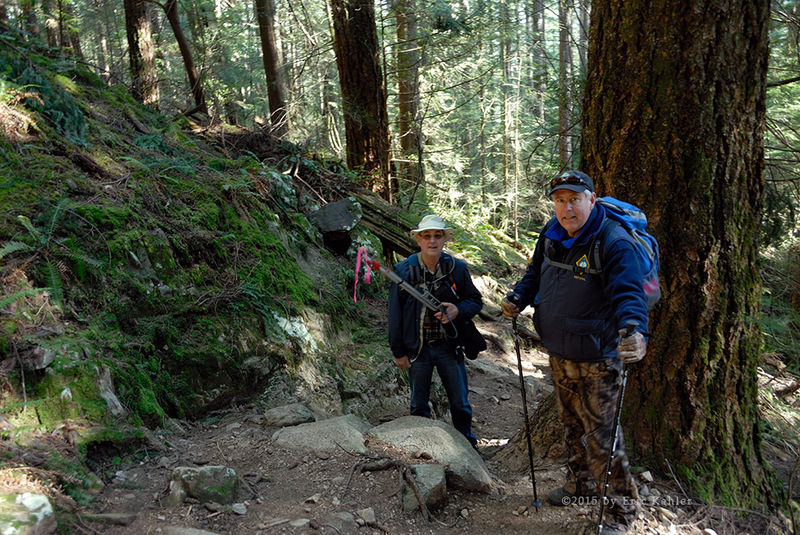 Our adventure began with the guys meeting at my place at 8am for the drive to Buntzen Lake and the start of the trail. This started off smoothly but upon starting across the Port Mann Bridge we noticed that the right lane was separated from the left three with a temporary construction barrier. This continued the entire length of the bridge and it prevented us from exiting to the #7 highway. I guess there was a sign before the bridge that we missed telling us to get over if we needed to exit. So we had to continue past and take the next exit and return along the highway. With all the construction we next missed a sign directing us to the main Lougheed highway and ended up on the Mary Hill Bypass. Not a huge problem but it did add some extra driving to our route. Fortunately we had lots of time and soon we were back on track and driving into the Buntzen Lake parking area. We quickly got organized, locked up the car and started off for the trail. There were already quite a number of cars parked with other hikers setting off in various directions. The lake has a large number of trails from easy to quite strenuous. Ours was a middling level trail though it does have a pretty steep section just below the summit. 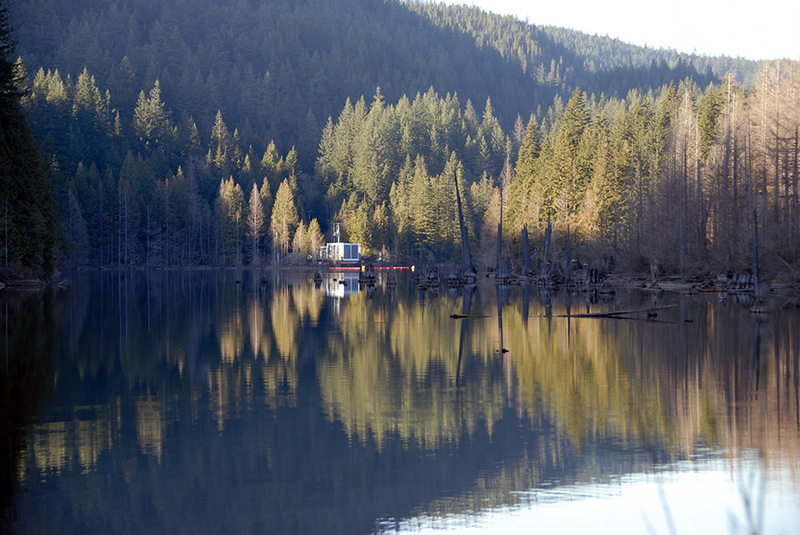 We made fast time along the level trail leading to the floating bridge over the south end of Buntzen Lake. I use the term ‘floating’ loosely because the old floating bridge has been replaced with a solid causeway with only a short segment that is actually a bridge and floating. I was definitely disappointed when they removed the old bridge as they also cleared out many sunken logs that offered some amazing micro-habitats to photograph. Once across the bridge the Diez Vistas trail officially starts. The initial section is through a lovely forested area. It makes some elevation gain but generally isn’t too steep. It being a cool ideal morning for hiking, I made good time hiking this section of the trail. When we reached the power lines, we took a longer breather as the steep section was about to start. 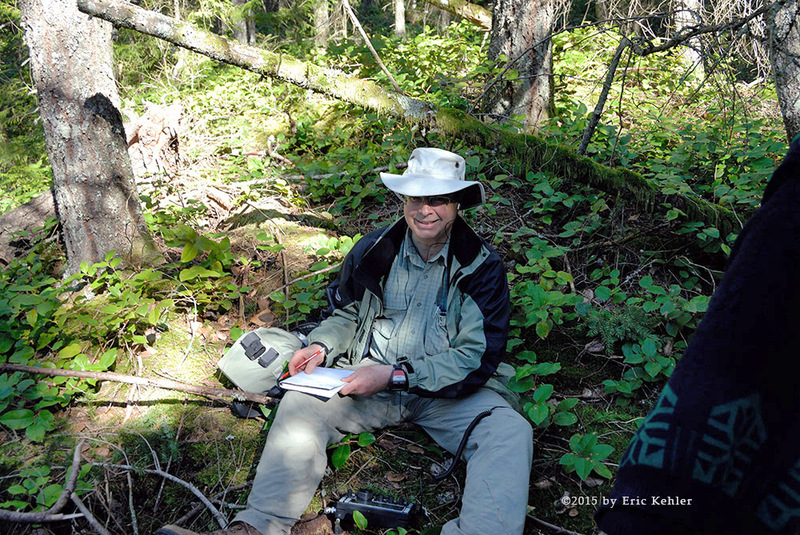 The day had continued to clear and it was looking very pleasant for radio operating which encouraged us as we approached the steep section of the trail. The next portion of the trail is shorter than what we had hiked but much steeper and we had to scramble up some rocky sections as we approached the first viewpoint. 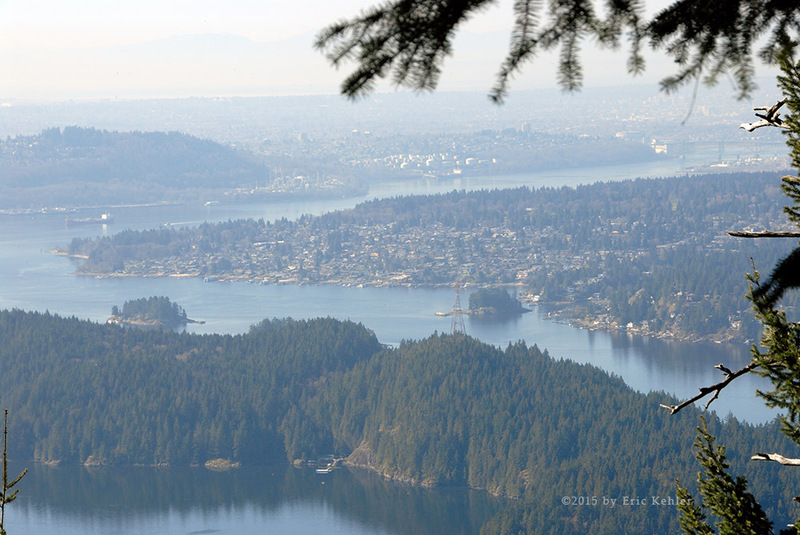 Once we had reached the viewpoint, I stopped to gather some photos of Vancouver and Burrard Inlet. The view really was quite lovely for such a low elevation. The trail was busy with several groups passing us on the way up and we encountered a few more at the viewpoint. Fortunately it being early in the season the numbers of hikers was not through the roof. Done with the view we continued up the trail and another steep section to arrive at a small marker nailed in a tree stating 560m. It was quite close to the coordinates we had for the summit. It was however about 15m away from what looked to be the true summit of the ridge. As we were doing a SOTA activation we decided to setup near the official location and next to the trail. We did string the antenna out over the actual summit and so I guess you could say we had both covered. I made a couple of quick contacts with my hand-held to club members back in White Rock. We had good strong signals and so got our activation off to a fast start. While I was making those calls the guys were setting up the HF equipment and antennas and soon they were on the air as well. Over the next two hours we were there we made a total of 9 contacts. We likely could have done much better but our weak signal was being trampled on by others who were participating in a popular radio contest. Never-the-less it was fun and we had a good time. While the team was busy making contacts, Ralph and I set off for the second viewpoint as it is the best one along the trail. I had remembered it being fairly close by but after walking some distance and descending a moderate amount we decided to turn back. It seemed to be much further than I remembered and we didn’t want to be away too long. I guess we’ll need to come back and do the actual hike. Once 2pm arrived we started to pack up and get ready for the hike down. We followed the same route and made another stop at the first viewpoint. Now that the sun and changed position the view was markedly different from the morning view and so I took a number of photos from the spot again. The hike down was rough on the ankles and knees but we all made it in decent time and had no serious injuries along the way though one of the team did manage to slightly twist their ankle early on during the decent. So we arrived back at the car having activated the summit and enjoying the fresh air and closeness to nature. Our drive home went better than on the way out and we were soon back home recovering from the day.